The 2018 fishing season commences on Sunday April 1st. Permits are at Siop y Bont Llanybydder. Ask the staff at till for details. At moment no news from NRW regarding new rules, so please follow existing club rules. Please be aware that this may change during course of season, we will keep you updated as soon as we know. Good luck for 2018 season, and tight lines. 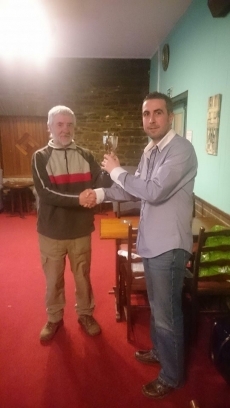 On Friday November 17th, Llanybydder Angling association annual Dinner/Presentation night was held at the Black Lion Hotel Llanybydder. The Guests were welcomed by the kind hospitality of the Black Lion and staff with delicious food served. 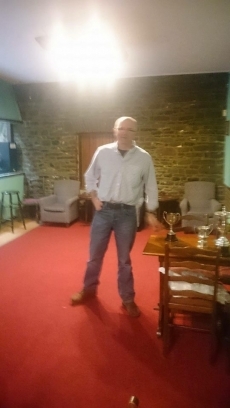 Following the meal, The Club chairman Mr Emyr Jones addressed the guests with an informative speech and a review of the angling year gone by. Our guest of honour was Mrs Jen Jones, our club President. Mrs Jones awarded the trophy winners for this years fish caught to the following members. Special thanks to Andrew And Carol for arranging the evening. Thank you all for attending and best of luck for next season. 2017 fishing season Permits are now available to buy at Siop y Bont (Londis) Llanybydder, just pop in and ask the counter staff for details. New season starts on Saturday April the 1st. Good luck with your season ahead and Tight Lines!!! On Friday 11th November 2016, our annual Angling Association dinner/awards night was held. The venue this year was the Castle Green Lampeter. A very good number of people attended. The food and service was outstanding to say the least in a very homely setting. 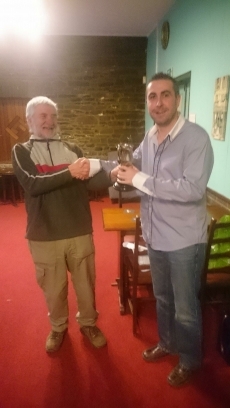 After the formalities and informative speech by our Chairman Mr Emyr Jones, the awards for this years best catches were presented. Best Salmon :- Calum Herbert. Best Sea Trout:- Darren Busby. Best Brown Trout:- Ken Clemas. Best Junior Angler :- Calum Herbert. Once again Thank you all for attending and your support through out the season and hear hear for the 2017 season and continuous success. On Friday March 4th the annual club dinner and presentation night, will be held at the Black Lion hotel Llanybydder at 7pm. If you wish to attend, please contact Mr Andrew Morgan, club Secretary, (details on club officials section). The trophies for the winners of best catches for the 2015 season will also be awarded on the night. The new 2016 season gets underway on Friday April 1st, it's been a long hard winter and the long wait is over, so get your fishing tackle out of the attic and dust off the cobwebs. 2016 Permit fees are shown on the website and available from Siop y Bont. Also remember your NRW rod license. Tight lines for the new season and have fun, please contact us with your catch details and any photos etc, so we can update the website. 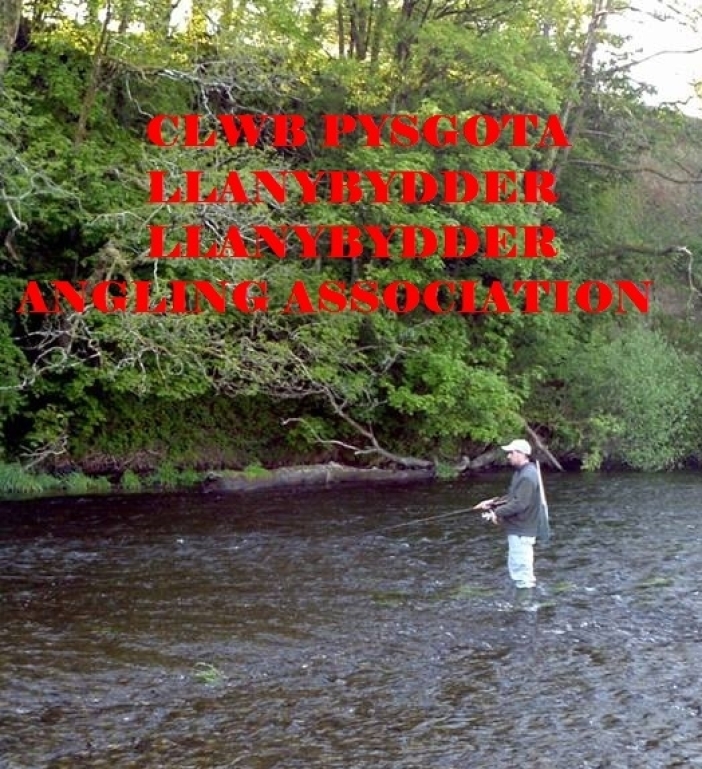 On Friday evening March 4th 2016, the Llanybydder Angling Association club dinner was held, at the Black Lion Hotel Llanybydder. A hefty gathering attended for the 7:30pm start. The Black Lion had been professionally laid out for the dinner, we all sat down for our delicious three course meal, where tales of fishing and catches were told. 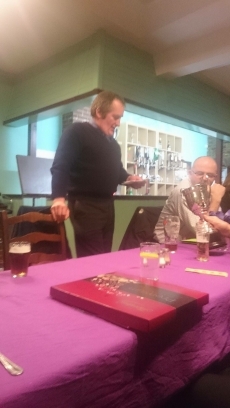 After the meal the traditional raffle was drawn, where prizes were kindly donated by fellow club members and friends. Association for many years, and his loss will be truly felt. A massive Thankyou was given to Mr Andrew Morgan and partner Carol who had worked hard in organising the dinner, which they kindly do year in year out. 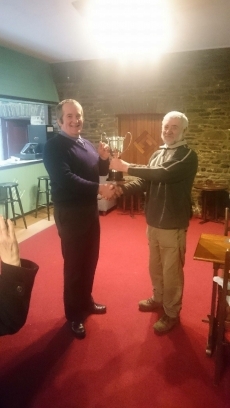 The presentation for the 2015 angling season was awarded then by Mr Alan Davies, a club stalwart for many years. The the best Trout fish was won by Mr Terry Herbert :- Brown Trout - 4.5lb. The best fish on a fly was won by Mr Terry Herbert :- a Sea Trout - 3lb. The best Sea Trout (Sewin) fish was won by Mr Karl Evans where Mr Andrew Morgans accepted on his behalf :- 9.5lb. The best Salmon fish caught was won by Mr Emyr Jones :- 16.5lb. Please see below photos of the dinner and presentation. Emyr Jones club Chairman with the speech. Terry Herbert best Fish on fly. Karl Evans, best Sewin collected by Andrew Morgan.